Anantara Dhigu Maldives Resort is situated on the stunning Dhigufinolhu Island and offers the ultimate luxury beach experience. 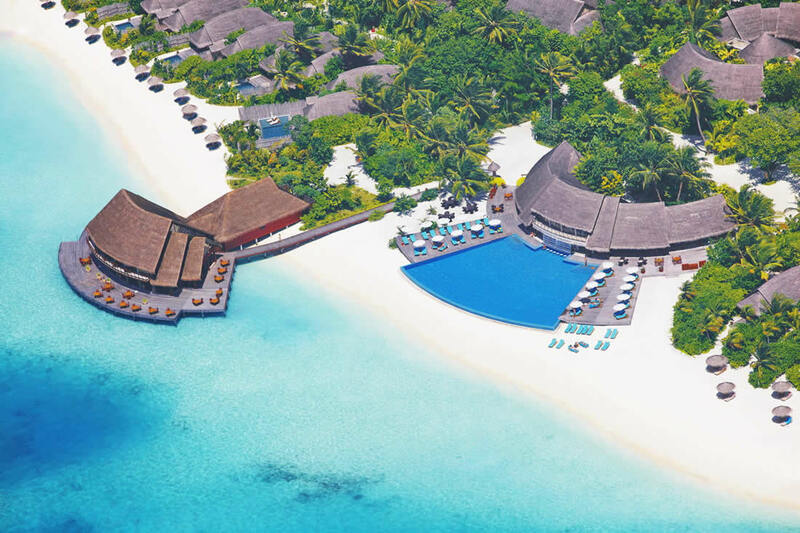 With crystal blue waters and miles of powdery, white sands fringed with lush, emerald-green vegetation, the 5-star resort ideal for families looking for a relaxing Maldivian escape. The couples will find an array of restaurants and an over-water spa, this island offers great value for money but with plenty of activities to keep the more restless vacation. 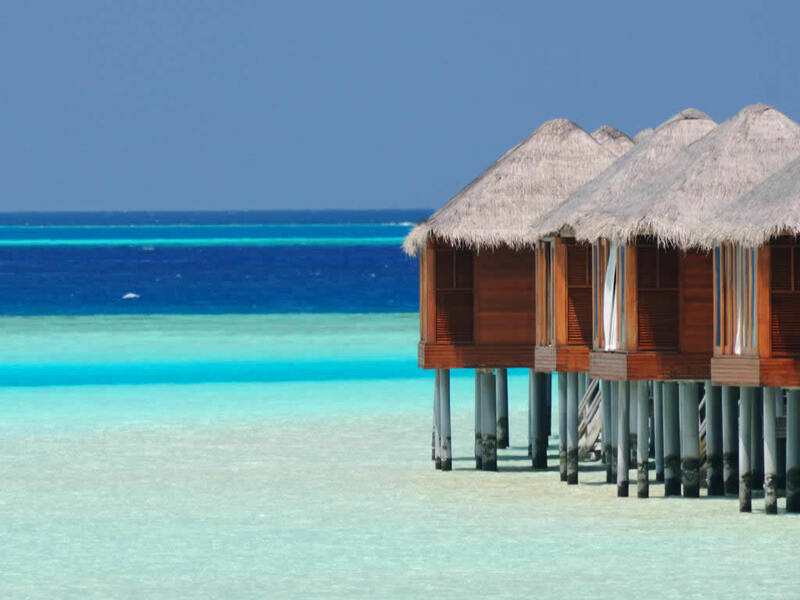 Anantara Dhigu's a breathtaking and luxurious accommodation offers the utmost in comfort to cater to every whim, from the exotic to the modern, sporting everything from rain showers to flat screen TV. Relish the resort’s impressive fitness centre, oceanfront infinity pool and sports facilities, or take advantage of the excellent range of water sports on offer. Indulge yourself at the incredible spa with a wonderfully relaxing signature massage from the true experts of their craft, all as you gaze dreamily through the glass floor at the vivid marine life as it drifts playfully by beneath you. When you emerge from this blissful encounter you can sate you appetite with any of the resort’s delectable dining options. With the finest food and drink available at you fingertips, fresh and delightfully presented, this will surely be a holiday experience you will savour for years to come. Blue and green like you have never see, Anantara Dhigu, on Dhigufinolhu Island in the South Male Atoll, is just a 35-minute private speedboat journey from the airport boasting spacious villas on the beach and over the water, some of which have pools. The hotel is set in a picturesque lagoon shared by two other Anantara islands. Arriving at Male Airport, you are warmly greeted by a member of the Anantara team who readily assists you with your luggage and whisks you away to their airport lounge where you are offered snacks and drinks until the boat arrives. The proximity to the airport means that guests can really maximise their holiday, while still being far enough away to get the desert island feeling so many guests crave when they visit the Maldives. So while others are still waiting for their seaplane, you’ll be sipping mojitos at the pool bar or snorkelling the magnificent house reef. Upon arrival at Dhigu, expect an even more spectacular Maldivian welcome! You'll be welcomed with joyful music and sincere smiles as you get down from the speedboat. Fantasy Island style arrival drums, a fantastic team from front desk to management staff all deliver superb feel good factor. Maldivian-style decor – think thatched roofs and dark woods – are designed to blend into the natural surroundings, while overwater villas, restaurants and spas make the most of the Indian Ocean views. 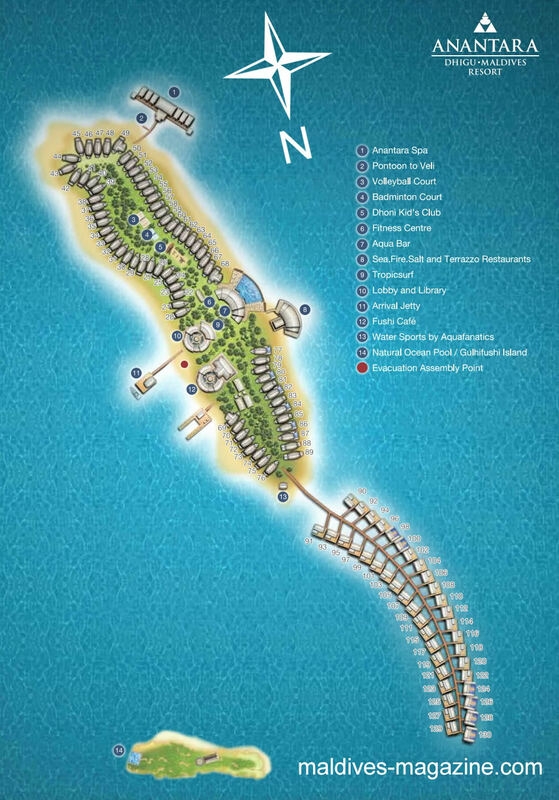 Stretched from north to south, Dhigu ?fi nolhu Island is measured 540 m in length and 160 m width. Blessed with white, talcum powder sands, Dhigu's beaches flow with the seasons and are always at large on the island, if not all the way round. At these resort, for most rooms most of the year there is a glorious beach right outside the door. On the clean beach in front of each villa you will find sun beds and pretty straw umbrellas. 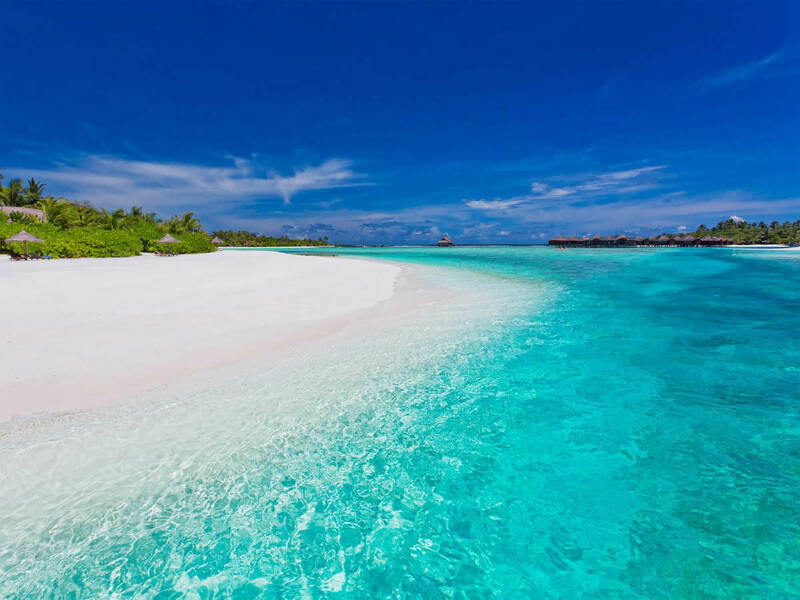 Anantara Dhigu Resort is surrounded by soft, white sand beach on Dhigufinolhu Island in the South Male Atoll, a 35-minute speedboat transfer from the island nation’s international airport. The blue lagoon is shared with our two sister properties Anantara Veli Resort and Naladhu Maldives, giving you access to a wider range of dining options, activities and facilities. The 110 spacious villas and suites are either perched over the Indian Ocean or nestled on the beach, and come with sunrise or sunset views, private terraces (some with a pool and villa butler on call), freestanding bathtubs and separate showers. Rooms are decorated in soothing seaside hues with wooden furniture and floor-to-ceiling windows to reflect the laid back atmosphere of the island. The open bathroom set-up is intimate yet allow appreciation for the nature that's intertwined in the design of the villa. Beach Villas at Anantara Dhigu Resort perfectly positioned to catch the sunrise or sunset, or those that have their own private plunge pool. Each villa comes with direct access to the powdery white beach and only steps away from the tranquil lagoon. 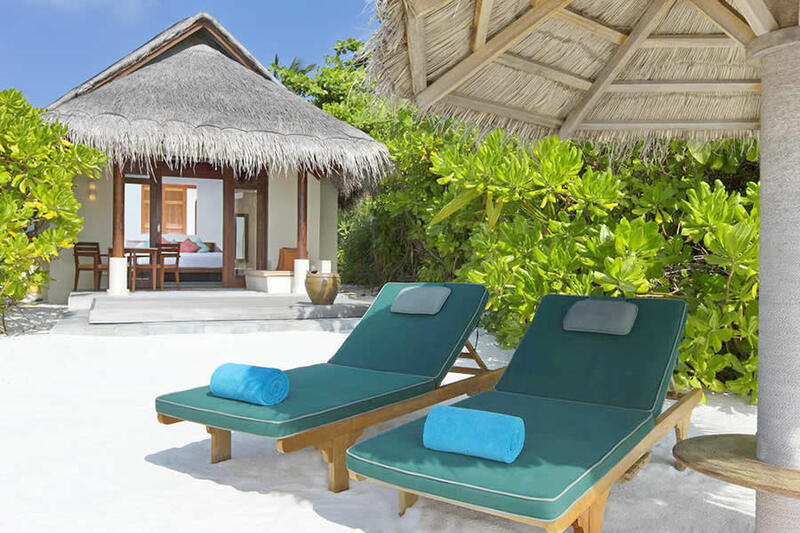 In 2019, Anantara Dhigu Maldives Resort unveiled luxuriously refurbished beach villas. Nestled in lush foliage along silvery shores, the updated beach villas retain the resort’s relaxed beach ambiance, now with a refreshed palette of sophisticated neutral tones that reflect the island’s natural hues. Darker timbers have been lightened with soft ivory and beige, brightening interiors and creating a refined beach-house vibe with infusions of tropical charm. Bathrooms have also been rejuvenated to offer sleek indoor and outdoor spaces. Guests can sink into a deep oval tub in their courtyard garden, or retreat to the cool of a glassed-in air-conditioned area. On each villa terrace, a traditional Maldivian swing has also been added, lending an authentic touch of local culture, and inviting guests to enjoy balmy island breezes in their own private sanctuary. Sunrise Beach Villa is ideal for early birds Wake up with the rising sun in your generously sized Villa. The marine decor complements the environment and guests can enjoy the outdoor bathroom with large terrazzo bathtub under a thatched roof. Sunset Beach Villa gives you to enjoy a dramatic sunset from your sun lounger in your garden or dining under the stars on your private deck. Comfortably equipped with modern amenities, these Villas are ideal for a secluded break. Indoors, you’ll be delighted with the large outdoor bathroom featuring a terrazzo bathtub semi indoor shower and outdoor rain shower, tropical vegetation, as well as a dressing room and minibar area behind the king bed. The classic island style of this luxury Maldives resort belies a host of modern comforts, including flat screen satellite TV, MP3 player, WIFI, CD/DVD player, and mini bar. 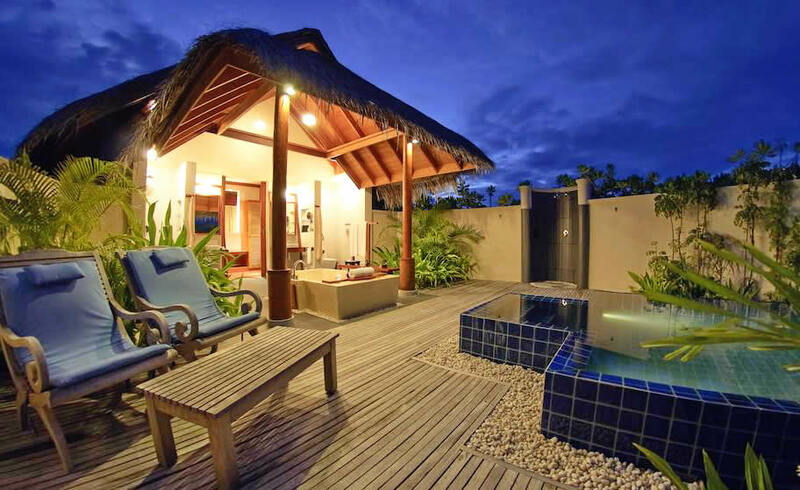 The resort's Sunset Pool Villas comprise 180 square metres of prime luxury accommodation on Dhigu beach. Lounge on your own stretch of powder white sand, cool down in the villa’s private plunge pool or take a stroll round the lush tropical island. Each Sunset Pool Villa at Anantara Dhigu Maldives is designed to offer the utmost in Maldives 5 star resort comfort, with locally sourced high-quality decor and an array of guest amenities. Facilities stretch from a terrazzo tub, outdoor rain shower and dressing room area to modern conveniences including flat-screen satellite TV, MP3 player, CD/DVD player, and mini bar. Set above the crystal clear waters with 132 square metre of living space, Over Water Suites is designed to offer the ultimate experience among Maldives luxury hotels. Witness glorious sunrises or sunsets, depending on the aspect of the suite, from your personal over water sun deck. Lie back in the tub or take a swim in the crystal turquoise sea thanks to direct lagoon access. Each of Anantara Dhigu Maldives’ Over Water Suites features a spacious indoor bathroom with lagoon views, a dressing room area, indoor and outdoor seating areas, and private sun loungers facing out to sea. In-room amenities include flat-screen satellite TV, MP3 player, CD/DVD player, and a mini bar. A very specia room category, Anantara’s Over Water suites all benefit from glorious ocean views for the perfect Maldives luxury hotel experience. Upgrade to Over-Water Suite will give you a compile fastidiously designed indoor living space with your own expansive private deck and swimming pool with sunset views. The over water sun deck has loungers, a dining area and direct lagoon access for you to swim in the turquoise Indian Ocean, while indoors you’ll find a king bed, cool day bed and infinity-edge bathtub. The palatial space is finished in signature Anantara style, abound with island fabrics, silk cushions and teak furniture. Along with glorious ocean views and your own private pool, each room is also equipped with flat-screen satellite TV, MP3 player, CD/DVD player, and a mini bar. Two Bedroom Anantara Pool Villa offers total comfort for either families with teenagers or groups of friends. 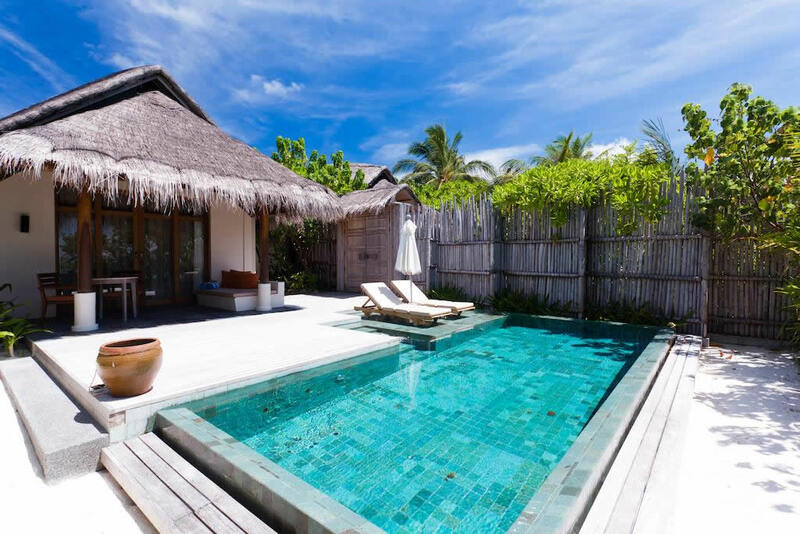 Taking in awe-inspiring vistas of the Indian Ocean at sunset, these Maldives villas come with a private plunge pool, outer connecting the two beach villas is an expansive beachside deck with sun loungers and verdant tropical gardens that wrap around the space. Two adjoining sunset side beach villas, each comprising a bedroom with king bed, dressing room, bathroom with terrazzo tub, extra beds and baby cot on request. Anantara Dhigu is extremely family friendly. Parents can relax while little ones are entertained for hours and spoilt for choice with Anantara’s kids club and numerous activities available. Thrill the family with adventures that include water bobbing, surfing and deep sea fishing. Families can even take a short pontoon ride to the island of Guli Fushi, picnic on the deserted beaches and experience some of the best snorkelling in the Maldives. Two Bedroom Family Villa ia ideal accomadation option in paradise with your family in a beautiful semi-connected villa spanning 312 square metres. Two separate villa bedrooms feature a spacious open air bathroom and are outer-connected via your sundeck. For more fun there ia a private plunge pool here, a breathtaking sunset view and direct beach location. Mini guests get their own bathrobes and slippers. Cots and extra beds are available. The resort's restaurants have children’s menus (children under six eat free); and the charming Dhoni Kids' Club is open to children from the age of 3 to 11 years unaccompanied and has two air-conditioned play rooms in traditional Maldivian boats, a climbing wall and a tree house. Those younger than 3 years can attend if accompanied by a parent or babysitter. Activities include scavenger hunts, coconut painting and dodge ball. Babysitting can be arranged for little ones from three months old, and there is a 24-hour resort doctor. The cuisine at Anantara Dhigu is an inspiring Maldives restaurant gastronomic experience. Dining is relaxed and informal, with an array of seafood and meat grills, fine Italian cuisine and varying themed buffet dinners, to lighter meals poolside for lunch. There are four restaurants on the island. The food is exceptional in all of them, but we must say that Sea Fire Salt is at the top of the list. Beachfront Fushi Cafe serves an international breakfast buffet alongside made-to-order eggs, waffles and Asian noodles; pool bar Aqua is all about cocktails and casual bites like burgers and salads; Sea.Fire.Salt is perched over the lagoon and specialises in freshly caught Maldivian fish and grilled meats; and Terrazzo is an authentic Italian fine eatery. Alternatively, take a quick pontoon ride across the lagoon to sister resort Anantara Veli for one of the best Thai meals you'll experience in the Maldives at Baan Huraa, or try theatrical teppanyaki at modern Japanese restaurant Origami. Guests on dine-around half or full board can make full use of the restaurants on both islands, while guests on regular full or half board can eat in the main restaurants (Fushi Cafe and 73 Degrees) while getting a credit towards the other restaurants.The only negative is the alcohol here is very expensive. Fushi Cafe is the main dining place for hearty breakfast and theme dinner buffets. Set on the white sandy beach of Dhigu Island, Fushi Cafe serves a lavish full breakfast buffet each morning complete with live cooking stations. 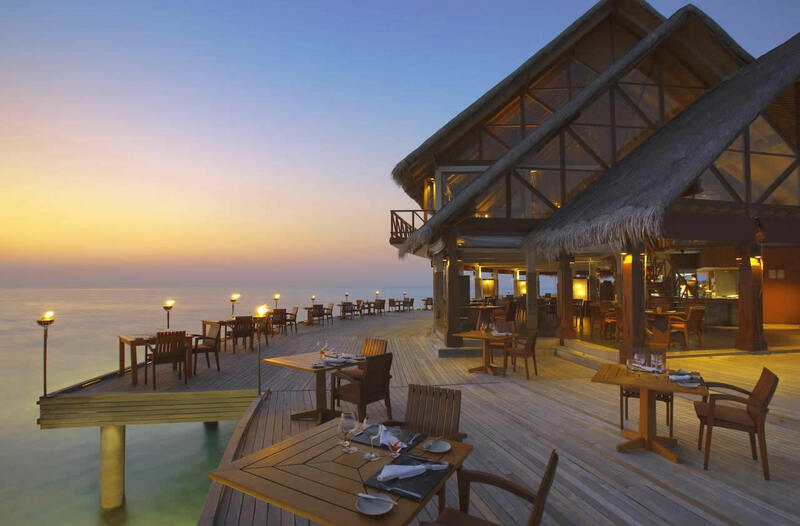 Then, as the sun sets, the restaurant transforms to offer a buffet with a variety of flavours including international cuisines and local Maldivian food. Dining by the sea at its very best. Sea.Fire.Salt. 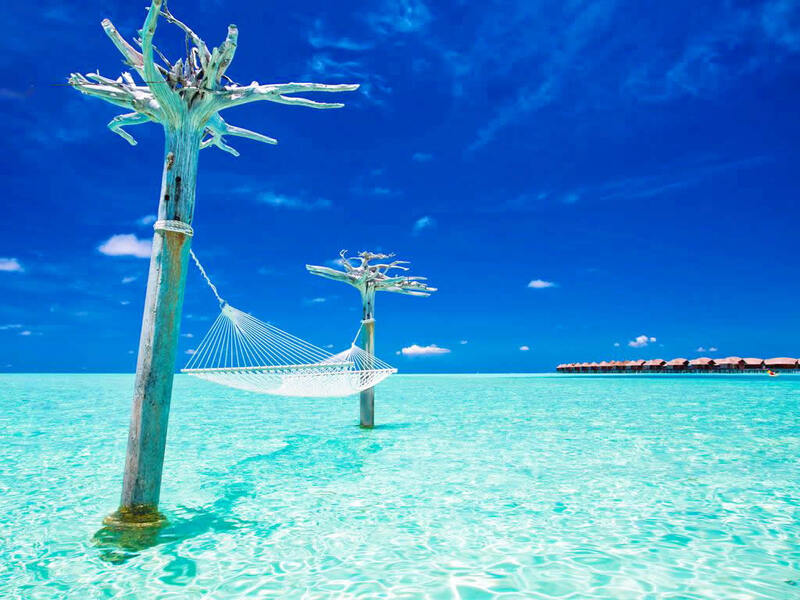 is set an alfresco wooden deck that is suspended over the turquoise lagoon. Choose from expertly grilled meats and seafoods such as reef fish, lobster and prawns, and prime-aged imported cuts from Australia and well as freshly caught Maldivian favourites at this special venue. Try dish flame-grilled, tandoori-style, wok-sauteed, or cooked to perfection in a wood-fired oven. Vegetarian options also available. The experience is accentuated by their salt selections from around the world, which the resort's Salt Guru will pair with your meal. The SEA.FIRE.SALT restaurant at Anantara Dhigu Maldives Resort has won the 2018 World’s Best Wine Lists Awards. Anantara Dhigu brings fine Italy cuisine to the tropics at Terrazzo, an intimate ocean-view restaurant serving rustic Italian favourites like wood-fire pizzas, homemade pastas and delectable seafood. Signature dishes include homemade lobster ravioli, delicious pasta, stableside-spun Caesar salad and a sumptuous seafood spread. Accompanying the food is a selection of wines from both northern and southern vineyards of Italy, paired perfectly to your meal thanks to the resort’s Wine Loft. Providing poolside refreshments and light snacks, Aqua by Anantara Dhigu Maldives is the perfect gathering point for another day in paradise. Accessible both in and out of the water, you can swim up to the bar and create your own cocktail from our range of ingredients. Early evening ushers in picturesque sunsets while you savour a drink in the lounge area. The Dhoni on Anantara Veli and Aqua on Anantara Dhigu are ideal places for a poolside sundowner. For those guests who want something a little more unique, Dining by Design can take them anywhere they choose on the islands, from the beach to a more remote sandbank. 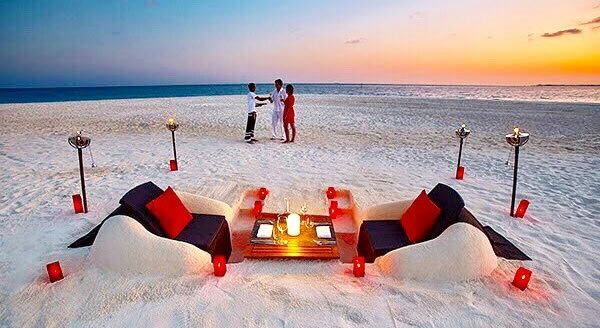 Love a banquet on the beach? A candlelit dinner of Maldivian food on your own stretch of sand or desert islanâ that a barbeque attended by a personal chef on your terrace? Dhigu's restaurants extend beyond the dining room. Let the resort plan you romantic fine dining for two in countless, secluded getaways either at Anantara Dhigu or its sister resort Anantara Veli. Dine on fragrant Thai cuisine in a beautiful over-water teak restaurant with ocean views. Baan Huraa at Anantara Veli serves a unique dining experience concocted by some of the finest Thai chefs. The signature dishes include coconut curries from Thailand’s southern provinces as well as hot and spicy dishes from the north, bound together by an authenticity of flavour. 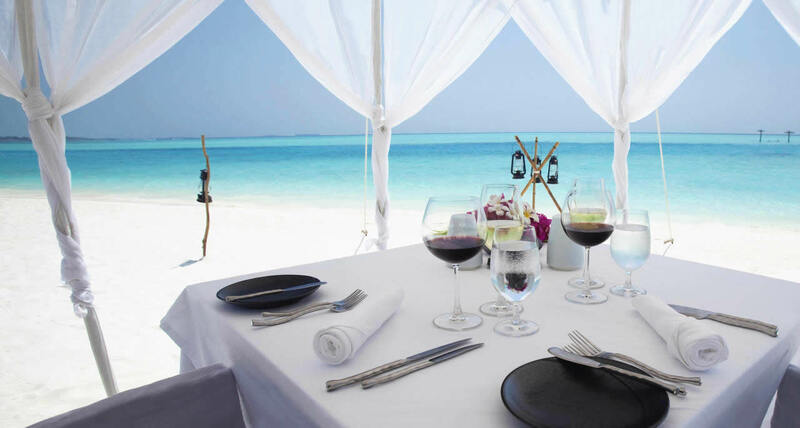 Baan Huraa is among the finest Thai luxury restaurants in the Maldives. 73 Degrees’ light and airy Maldivian style thatched roof pavilion faces the lagoon of Veligandu Huraa. Dine at the sumptuous breakfast buffet of fresh tropical fruits and juices, cereals, homemade breads, grilled meats, vegetables and made to order omelettes. This ocean view restaurant also has the perfect accompaniment to dining by the sea: a Seafood buffet where you can select fish plucked straight from the ocean. Origami – This modern and casual Japanese restaurant takes you on a unique dining journey with a choice of a light gourmet menu featuring hand-crafted sushi and sashimi and slow charcoal grilled robatayaki skewers. 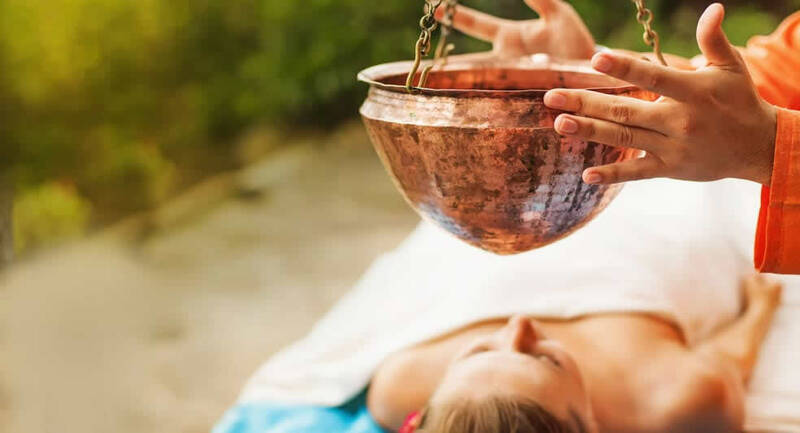 Anantara Spa offers a series of short “Well-being Retreat” packages, offering new two-plus day options for healthy, active experiences across several of its luxury resorts in the Maldives. Guests who stay for a minimum of two nights can dive into the Thailand-based hotel group's global well-being initiative, which rather than an immersion boot camp style programme, is designed to offer a flexible approach to feeling good on holidays, with guests splitting vacation time between wellness activities and regular leisure activities and sightseeing. The three-tiered programmes are based on a notion Anantara calls “Balance Wellness,” intended to balance mental and physical health using cuisine, signature spa treatments and dynamic or mindful exercise. Each package showcases the resort's own indigenous experiences and are designed for two people in order to entice couples, best friends, or families to acquire inspiration, knowledge and practical experience they can incorporate into their daily wellness routine once they return home. In the Maldives, Anantara is offering the Well-being Retreat packages at all three of its resorts; Anantara Dhigu Maldives Resort, Anantara Veli Maldives Resort and Anantara Kihavah Maldives Villas. Anantara Dhigu (USD 1,629 excluding taxes): Includes stay of two nights or more, daily buffet breakfast and dinner for two persons, a 90-minute Marma Massage for two persons, a 30-minute Elemis Intensely Cleansing Salt Scrub – Lime and Ginger or Frangipani for two persons, a 60-minute private yoga session for two persons, a healthy set lunch at Dhoni Bar for two persons, and 10 percent off Anantara Spa menu a la carte spa treatments and spa retail products. 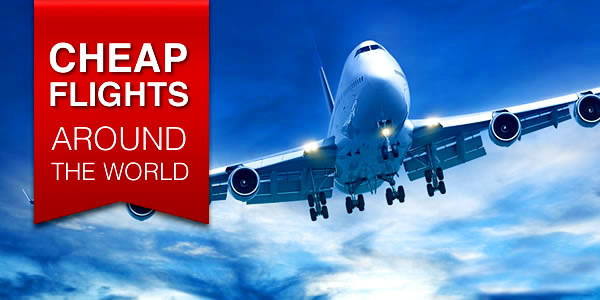 A range of activities and excursions is available. Active guests can sign up for yoga, air-conditioned fitness centre and tennis courts, diving, beach games and surfing (one of the few spots to offer this in the Maldives) before indulging in coconut-based treatments at the Dhigu Spa or cooking classes in the chef’s garden. 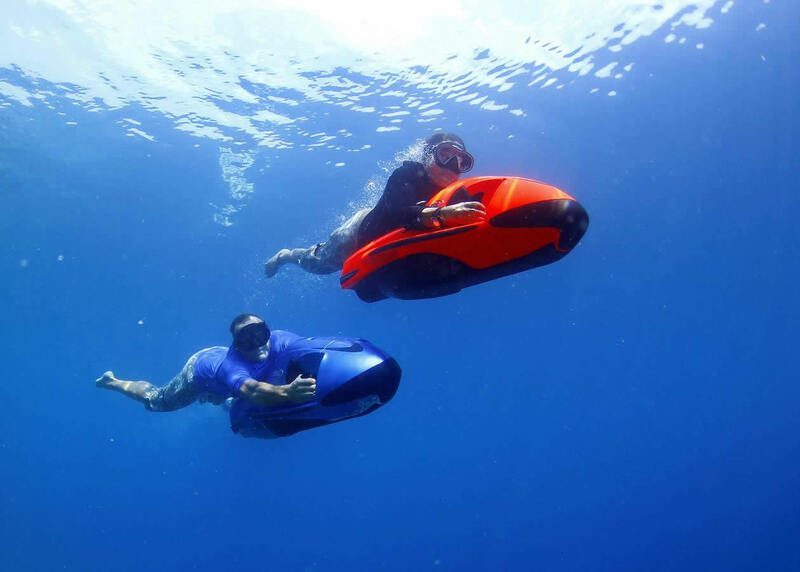 Watersports activities include diving, snorkelling and the underwater 'rocket' - the Cayago Magnum, which allows the guest to whizz along below the water's surface at 20km per hour, almost as fast as a dolphin. There are also jetskis - Yamaha WaveRunners available with a private guide; kayaking which can be done on the Anantara lagoon, some of which are glass to enable guests to see below the water's surface; sailing in a K1 Top Cat or the new Bravo Mini Cat; windsurfing; speedboating, waterskiing and parasailing. Surfing is also available. If you dreamig to spot a pelagic species - Manta & Whale shark snorkelling from May to October. Anantara Dhigu, Anantara Veli, and Naladhu Private Island share a dedicated surf center. The surfing center offers great instructors for beginners and experienced surfers. Step into tranquility in Anatara Spa over clear turquoise waters for a serene and calm retreat. With 6 treatments suites, choose from a range of treatments inspired by indigenous practice and ingredients. Share quality time with a loved one through specially designed packages for couples. We also recommend an excursion to capital of Male or go island hopping for a glimpse of the Maldivian culture; have a picnic on a neighbouring island; go for a sunset cruise with a personal wine cellar, bar and chill-out area on-board while sipping champagne; go deep-sea or night fishing, or even go surfing. As one of the Maldives' finest resorts, it's not surprising that reviews for the Anantara Dhigu hotel are extremely positive. Most describe the setting as stunning and the rooms, particularly the overwater villas and suites, as huge and extremely well appointed. Service also gets high marks, as does the food at the many restaurants at both adjoining resorts, though of course there are a few people who were disappointed in at least some aspects of their stay. Still, the Anatara Dhigu Resort deserves its reputation for excellence and it seems it almost always delivers. Spacious, super comfy and clean rooms, especially over-water suites with amazing views. The rooms are cleaned twice a day. Half board option is all you need. Breakfast is plenty and the dinners are amazing. They set up a buffet dinner on the beach. Plenty of free drink water on the island. Your room get restocked twice a day. a fantastic choice of dining at two resorts. 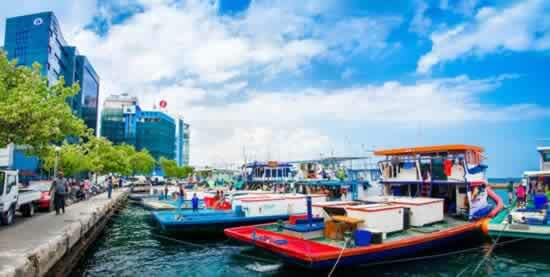 There is a boat that u can take to go to Anantara Veli resort. When you dine in 'Salt' a Salt Guru will tell you which salt is recommended with your chosen dish - they have an interesting selection of different salts on offer! In 2018 Anantara Dhigu Maldives Resort has won prestigious titles as Maldives’ Leading Family Resort award at World Travel Awards.